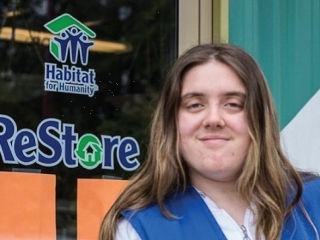 PJ has been volunteering at the Habitat for Humanity ReStore since December, 2011. When we first met her, PJ and her support worker, Sarah, were keen to learn more about how our Youth Volunteer Connections Program (YVCP) could help to find a volunteer position to support PJ’s learning and work goals. PJ wanted to gain experience that would lead to paid work stocking and organizing shelves in a retail environment. Our experienced YVCP staff worked closely with PJ to find a suitable position. 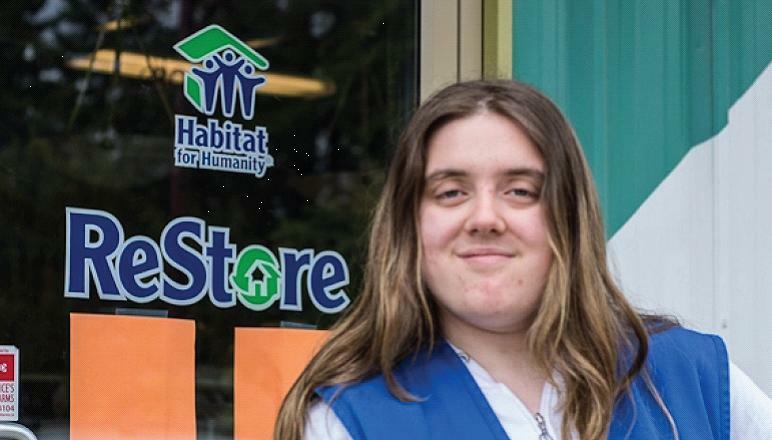 It’s not always easy to find the right “fit” right away between a volunteer and an organization, but with perseverance and patience, PJ and Sarah found their fit at ReStore. They have enjoyed spending one hour a week over the last 6 months cleaning and organizing incoming donation items, and setting them out on the sales floor. YVCP staff had the pleasure of meeting with PJ and Sarah for this interview on their last day of volunteering together. The relationships built and experience gained over the past six months were evident and heartwarming, as the assistant manager and the volunteer coordinator came in to say thanks to PJ with a card and a hug. PJ gives her volunteer experience at ReStore a 9 out of 10: “I really like working with David and Lyle, and the other people here.” Sarah shares that PJ has gained some essential work skills – greeting people with a smile, learning colleagues’ names, and getting the work set out before her completed. Skills PJ learned and applied hands-on through volunteering that will continue to serve her well in her future goals. PJ has definitely been bitten by the volunteering bug; she would now like to start volunteering with young people who have disabilities or cognitive differences. What a great role model she will be to her younger peers! Sincere thanks to PJ, Sarah and the Habitat for Humanity ReStore for their important contributions to, and support of, our community. The Youth Volunteer Connections Program team has been proud to support you in your journey. We also wish to acknowledge and thank our YVCP funders: Coast Capital Savings, Anonymous Funder, United Way of Greater Victoria and ING who help us to change lives everyday.